Black Cable Ties 160mm x 4.8mm. These black cable ties are a moulded one piece, manufactured f..
Black Cable Ties 200mm x 4.8mm. These black cable ties are a moulded one piece, manufactured fr..
Black Cable Ties 300mm x 4.8mm. 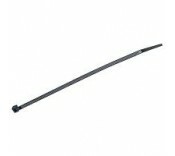 These black cable ties are a moulded one piece, manufactured fr..
Black Cable Ties 370mm x 7.6mm. These black cable ties are a moulded one piece, manufactured f..
Black Cable Ties 450mm x 7.6mm. These black cable ties are a moulded one piece, manufactured fr..
At Manchester Safety Services, we stock black cable ties in a selection of different sizes. From 160mm to 450mm, we have the black cable tie for jobs, both small and large. This ensures that even large groups of cables can be tied safely and effectively. Black tie cables are ever important to the safety of office and industrial workers alike, ensuring there are no loose cables for employees to trip over or injure themselves on. From small computer wires to large industrial cables, careless storage can lead to injury. Black cable ties can be equally important at home, helping to store loose computer and appliance wires safely, protecting you and the family. As well as the safety implications, well organised and safely tied cables can help organise and maintain the wires. Damaged can occur in tangled wires over time, leading to reduced efficacy and performance. Similarly, well organised wires will be easier to remove and locate. All of our black tie cables are made of a high quality, durable Nylon 66 material that will retain integrity even after extensive use. Our black cable ties come in packs of 100, offering a significant quantity to ensure that all cables are safely and securely tied. The one-piece products are incredible simple to use, simply loop the tail of the tie around the cables and feed through the mouth. Tighten accordingly and the tie’s teeth will ensure the tie and the cable both stay in place.